Spinal, upper limb and lower limb conditions associated with biomechanical dysfunction, ergonomics or lifestyle. Pre and post surgical rehabilitation of shoulder and spine. Martine Cooper graduated from the University of East London in 1992 with a first class honours Bachelor of Science Degree in Physiotherapy. She has gained valuable clinical experience working as a musculo-skeletal specialist in a variety of settings: NHS Hospitals including Chelsea and Westminster, Royal National Orthopaedic Hospital and the private setting ranging from hospitals to medical centres. 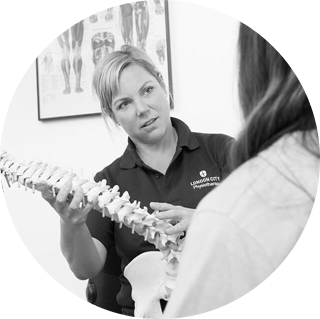 Martine has attended numerous post graduate courses to further develop her skills, which include acupuncture, manipulation, Clinical Pilates and specialist shoulder courses. With over 20 years clinical experience she has developed a special interest in the treatment of shoulder conditions and works closely with a number of highly respected upper limb and spinal surgeons in London. Her post graduate study, ergonomic consultancy and lecturing has also led to an interest in Occupational Related Disorders specifically Work Related Upper Limb Disorder (W.R.U.L.D). Martine has written a number of articles creating a huge resource of information on London City Physiotherapy website. These are available to read by clicking here. "I have visited LCP several times and have been unfailingly impressed by the quality of the care I have received. Martine and her team have successfully resolved my 'problems' on every occasion and I cannot praise them too highly. Excellent."